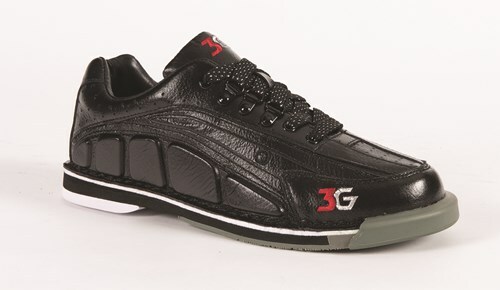 This Left Handed 3G shoe is made of the finest materials with the bowlers performance and comfort in mind. These shoes feature kangaroo leather which is said to be softer and more flexible than other leathers. Not only that, but these shoes have the interchangeable sole and heel so the bowler can get the best slide each game! As always, hassle free quick service. These shoes did not disappoint. I was informed the sizing was very true to size so I went with a size 10 as my foot is a literal 9 3/4" and they fit like a glove with about a 1/2" to spare from toe to cap. Incredibly comfortable with minimal break in time. Air vents EVERYWHERE on the shoes, my feet stayed pretty dry compared to my old ones. The unboxing was one of the best parts as I didn't expect them to come with a shoe cover or shoe horn. After messing around for about 30 minutes with the different slides and brakes I found what works for me and proceeded to put up a 276 and a 268. The only thing I could see anybody possibly needing to purchase beyond what the set comes with may be the adjustable brake as the included brakes seem to go from soft brake to hard brake with nothing in between, but that's most likely just my slide style as I prefer a long smooth slide. I use the product 6 days a week and bowl three games at least in those days and the shoes hold up great and don't feel like they are falling off your feet. I would even recommend getting the same shoe size as your ordinary shoe it fits pretty much the same. It is also just like any tennis shoe it fits and is really comfortable. For years I have been a wearer of Dexter shoes because, for one reason, I have big feet and Dexter was the only company that made shoes big enough. Finally, in 2017, 3G has begun making shoes big enough to fit my large feet. While 3G does not make a "wide" width shoe, these shoes are generally wider than other brands so I had no problems with comfort. The shoes are very stylish, very lightweight, and very comfortable from the first time you put them on. I wore mine around the house for a couple days just to help with breaking them in. Though I'm not sure that was necessary. There is a bit of a learning curve with the interchangeable soles as the numbering strategy is different. With other companies (i.e. Dexter) the higher the number the more slide you get. With 3G it's the opposite...lower numbers mean more slide. Once you figure that out there are no problems with slide adjustments. The cleated sold is truly an ingenious invention. The ability to customize your cleat combinations really provides a unique slide catered to your personal sliding technique. This is truly a tremendous high performance shoe which just may be replacing the Dexter THE 9 shoes that have been in my bag. Hello Francis! A European men's size 43 is equivalent to the US men's size 10. Hello Francis! All the soles and heels that this shoe comes with are listed on this item page. And yes, this is a left handed shoe. The 3G soles are number numbered the same as some of the other shoe models. The slide 10 from some of the other shoe companies is a felt sole and this shoe will include felt cleats to use with the cleated sole to give you a similar slide. There are many extras on this shoe so you may need to try the different soles to see which matches best for your style. If you even needed more soles or extras, we do sell soles as well. Hello Southpaw! Yes, the cleats are circular. 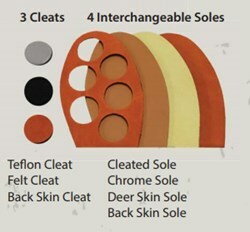 On the cleated sole, there are spaces for three cleats that Velcro onto the sole. Hello! I would recommend going with whatever size you wear in your everyday shoes. However, ordering this shoe is a bit risky because it is a closeout item and cannot be returned or exchanged. I am a woman who normally wears a US womans 9-9.5. What size should I order in these mens? Hello! Id you wear a size 9-9.5 in womens, you will want a size 7-7.5 in mens. It should be able to fit buy using the Velcro on the pad. Do they make E width in size 12 1/2 left ? Unfortunately, we do not have half sizes after the size 12. Unfortunately, we do not carry wide widths for Left handed versions, as well. Due to the time it takes to produce the 3G Mens Tour Ultra Black LH ball it will ship in immediately. We cannot ship this ball outside the United States.